Oh, the baby who refuses to sleep! It can feel as though this tiny little human you created is on a mission to break you through sleep deprivation. Don’t worry – there could be a number of other reasons why your bub refuses to slip into slumber. Splash your face with some cold water and consider our checklist of the five most common baby sleep problems and some suggestions to solve them. Babies quickly become creatures of habit so, if your bub knows that sleep time directly follows feed time, you may find that when they wake through the night, they can’t settle without a feed or stay asleep when their tummy starts to grumble. I learned this one the hard way when my son would fall asleep straight after a feed at around 10pm, only to wake with every sleep cycle until dawn, unable to self settle. I found by changing his routine – increasing his feeds before I headed to bed and changing his nappy (even if not needed) between feed and sleep – he gradually settled in for longer sleep stretches. The night air can be enough to wake anyone, especially as winter rolls on in. 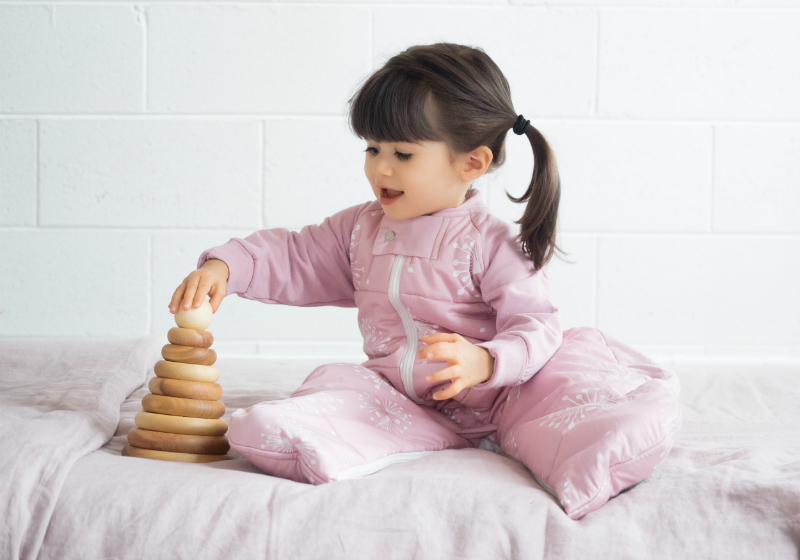 The best way around this for bub is to make sure their sleepwear gives them a warm night’s slumber and an ergoPouch Sleep Suit Bag is a perfect place to start. It converts from a sleeping bag to a sleep suit with legs – making the transition from cot to pram or car an easy one. It’s a perfect choice for older babies and toddlers who like freedom of movement, with grip pads on the feet for little walkers. The Winter Sleep Suit Bag also has cotton fleece sleeves with fold down mitts to keep baby warm and snug. Like the rest of the ergoPouch range, the Sleep Suit Bag comes in a range of tog ratings and sizes. Complete quiet isn’t necessarily a staple needed for baby to get a good night rest. In fact, by setting silence as the standard condition for sleep time, you could be making life a whole lot harder for yourself and your baby. But sudden and loud noises can be enough to startle even the most sound sleepers. In some cases this is a problem easily avoided but in others, especially if you have older children in the house, quiet cooperation isn’t always guaranteed. White noise or a bit of background music (perhaps a lullaby mix or an easy-listening radio station) can be of great comfort to baby and can help muffle any unplanned ruckus. Remember – it wasn’t long ago that baby was accustomed to the noises heard during their time in the womb. Just as we adults might struggle to transition from a head-banging session into deep sleep, your baby also needs time to wind down. As addictive as those baby giggles might be, it’s important to avoid really stimulating activities like tickle sessions right before bed. Revving them up when they are already tired can make it much harder for them to fall asleep. This doesn’t mean the night time routine can’t be enjoyable for both you and your baby! Try making story time and massage a part of the night time routine. When you first bring your baby home, that newborn smell and those koala-like cuddles can be so addictive. And, while patting, rocking or holding baby to sleep won’t spoil them, it can sometimes establish habits that can be difficult to break. This week you may be happy to forgo sleep for the night-time snuggle but next week, the sleep deprivation may catch up with you and rocking baby for an hour may take your exhaustion over the edge. Don’t fret! It’s not impossible to change this routine but you may find it will be a gradual process. Start by lessening the amount of rocking or holding time a little each night and try introducing another source of comfort, like a dummy, to help the transition. My son wouldn’t take a dummy, so after a week of gradually lessening the time I rocked him, I spent another week putting him in his cot and standing in the room until he settled and soon mastered the army roll out of there. Good luck!